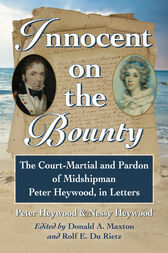 This is the first complete publication of a rare collection of letters and poems written from 1790 to 1792--many of which have never appeared in print--telling the true story of Peter Heywood, a young Royal Navy midshipman on H.M.S. Bounty wrongly accused of mutiny, and his devoted sister, Nessy, who worked tirelessly to save him from being condemned and executed for this crime. This edition is a faithful transcription of a manuscript held at the Newberry Library in Chicago--one of only five surviving manuscripts.